Your mother probably told you it’s important to wash your vegetables. Why? Because by the time your red and green peppers arrive in your kitchen, they’ve already traveled from a farm that’s most likely thousands of miles away, probably traveled on a plane, and been handled by 10 or so people, until being distributed to your local grocery store and, eventually, your kitchen. Although I knew this was true, I was always adamant that you don’t need to wash your vegetables. It’s not that I didn’t want to—it was just hard to fathom why it was so dirty, so every now and then I just gave it a little rub and ate it anyways, much to my mother’s dismay. But with the latest reports coming out of the Centers for Disease Control and Prevention (CDC), I’m wondering what really happens when you don’t wash your vegetables or prepare food safely. Turns out, you might end up with a foodborne illness. According to the CDC, about 48 million Americans are affected by food poisoning every year. Luckily, the numbers don’t seem to be increasing—but considering about one in every six Americans will suffer from a foodborne illness, there’s still cause for concern, and much more we can be doing to prevent it. Children under the age of five are more likely to be infected with a foodborne illness from one of the following bacteria: Campylobacter, Cryptosporidium, Salmonella, Shiga toxin-producing Escherichia coli (STEC) O157 and non-O157, Shigella, and Yersinia. Adults over the age of 65 are more likely to be infected with a foodborne illness from Cyclospora, Listeria, and Vibrio. But get this: when affected, older adults are much more likely to have severe complications or die from foodborne illness than any other age group. According to the CDC’s data, 13% of infections, 24% of hospitalizations, and 57% of deaths related to a foodborne illness occurred to adults over age 65. In general, anyone is at a higher risk if they have a weakened immune system, or are at a more vulnerable stage in their life (pregnant women, older adults, and very young children). How Can You Prevent Foodborne Illness? It’s important to treat your illness right away. According to the American Medical Association, only a fraction of people with a foodborne illness actually seek treatment. If you have a number of the above symptoms, especially after you’ve just eaten poultry or beef, contact your doctor right away. If it’s an emergency, call 911. If you think you’ve come into contact with a foodborne illness from eating a specific food, then you should report it. The U.S. Department of Health and Human Services mandates that if two people get sick from eating the same contaminated food, it’s called a foodborne outbreak, and therefore steps must be taken to prevent it. You can report it to your local health department. Our Take: Wash Your Vegetables! Foodborne illnesses can be uncomfortable at best, and lead to hospitalization or death at worst. 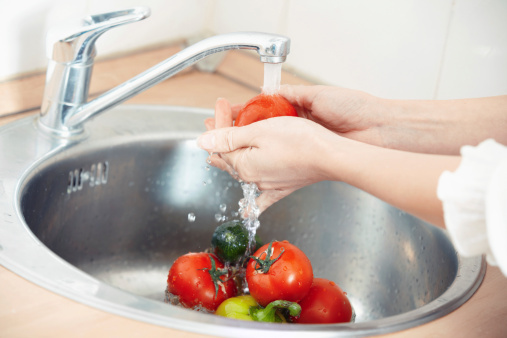 Stay healthy by washing your vegetables and following the other food safety tips we’ve provided. At Which Temperature Do You Need to Cook Your Food? U.S. Department of Health & Human Services; Centers for Disease Control and Prevention, Foodnet 2011 Surveillance Report 2012; http://www.cdc.gov/foodnet/PDFs/2011_annual_report_508c.pdf; last accessed April 2013. “Food Safety; Prevention and Education,” Centers for Disease Control and Prevention web site, December 3, 2011; http://www.cdc.gov/foodsafety/prevention.html; last accessed April 2013. American Medical Association et al., “Diagnosis and Management of Foodborne Illnesses,” Morbidity and Mortality Weekly Report April 16, 2004; http://www.cdc.gov/mmwr/preview/mmwrhtml/rr5304a1.htm; last accessed April 2013.